Rachel Carver’s past won’t leave her alone? 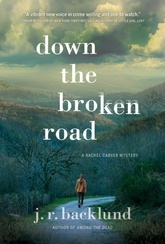 While on assignment for a prominent law firm, former North Carolina Bureau of Investigation agent Rachel Carver uncovers a link between a recent grisly murder and the case that ruined her career. This discovery is no coincidence. There’s a hidden player, one who is manipulating Rachel into uncovering the truth—whatever the cost. Meanwhile, the stakes turn even deadlier when the killer strikes again. On the run and desperate for answers, Rachel painstakingly peels back the layers of the victims’ lives—and discovers a shocking litany of murder and lies that began in a moment of fury on the front lines of the war in Afghanistan, and now threatens to claim even more victims. Will one of those victims be Rachel?